Welcome to the Super 8 Motel in Eagle River, Wisconsin! Expect to feel right a home with your stay with us. The Super 8 Motel is centrally located in beautiful downtown Eagle River, Wisconsin with the convenience of shopping, dining, or enjoying the many seasonal art and craft festivals all with in walking distance from our Motel. We have been smoke free since July 5, 2010! Eagle River, Wisconsin is a four season vacation destination, known as the Snowmobile Capital of the World, with over 500 miles of Snowmobile trails and home of the World Championship Snowmobile Derby. 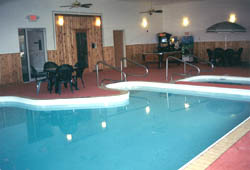 Eagle River also offers ice fishing, snowshoeing and cross country skiing and ice hockey for winter sport enthusiasts. Super 8 Motel is adjacent to snowmobile trail. During Spring Summer and Fall seasons, Eagle River hosts numerous seasonal craft and art shows, fishing tournaments, and the county fair. Eagle River has something for everyone. 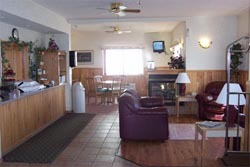 Super 8 Motel accommodates travelers with RV- Boat-Snowmobile-Craft Show trailer parking. Fuel your boat or snowmobile right next door. 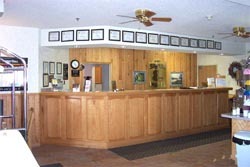 Super 8 provides clean and affordable lodging by day, week or extended stay. 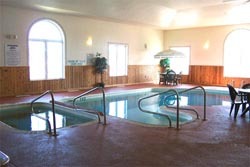 Our amenities include: Whirlpool suites, king suites, indoor pool, hot tub, conference room, super start breakfast, handicap rooms and facilities, cable TV and express check out with a 24 hour front desk. Eagle River Wisconsin Vacation Lodging at the Super 8 Motel in Eagle River Wisconsin.